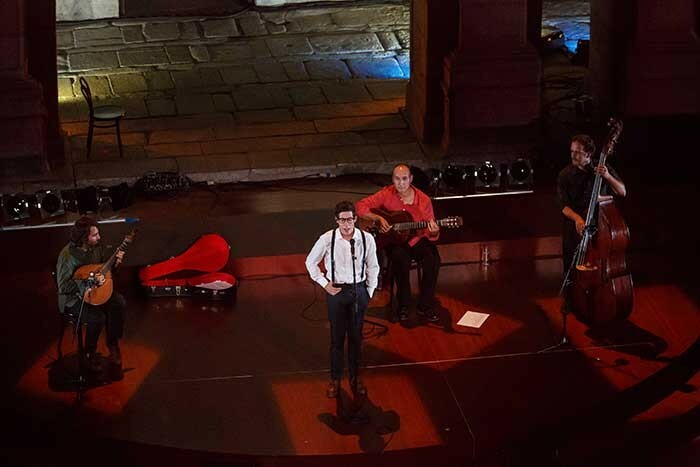 Portugal – A traditional Portuguese Fado concert held in the cloisters of 17th Century São Bento da Vitoria Monastery provided Francisco Leal, head of sound at Oporto’s Teatro Nacional São Joao, the long-awaited opportunity to get up close with Out Board’s TiMax SoundHub immersive dynamic delay-matrix and further cemented his intent to incorporate leading-edge TiMax immersive spatialisation into the Teatro Nacional’s in-house productions. The concert played in the covered, wooden-floored courtyard of the Monastery to a three section, fan-shaped audience position, during an International Music Week event that also doubled as album launch for the band. The multi-channel speaker system for the event, designed by Francisco Leal in discussion with Out Board’s Dave Haydon, who visited the venue to help fast-track the TiMax set up and programming, featured a rented TiMax SoundHub-S16 processor feeding all speakers separately via analogue outputs, and receiving mic and effects signals via analogue inputs fed from a Midas H2000 console. 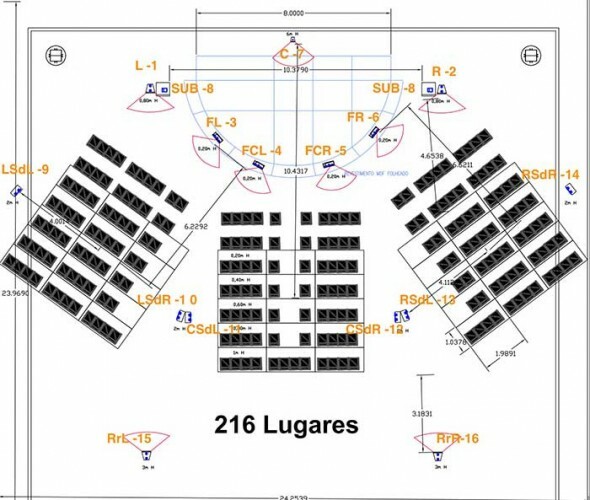 The main PA comprised four Meyer UPA1’s as front and rear left and right pairs, with six Roland SRS120 speakers in pairs as left and right side surrounds for each seating section. 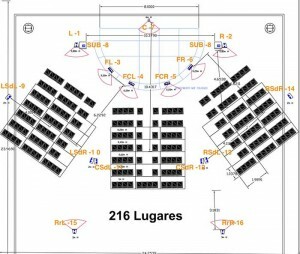 Four Meyer UPM1Ps were positioned on the stage as frontfills, with an additional flown cabinet for overhead effects, plus some Meyer subs positioned left and right of the stage. The tradition of Fado is that the musicians change positions during songs, so TiMax Cues were implemented to create localisations for each movement, as well as to produce an overall immersive spatial environment for the band’s standard stage format with the singer up front. 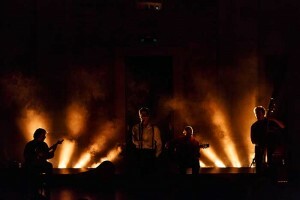 The other positionings for the four-piece band saw the two guitarists – standard acoustic and a large mandolin-style Portuguese guitar – move to sit in the chairs by the left and right PA stacks; or the Portuguese guitar player seated behind the band with the acoustic guitar sat far right, under an arch away from the rest of the band. For one song the young singer walked from a first-floor rear right balcony to a front-right balcony, with TiMax panning him automatically with a matching spatial reverb. Other TiMax cues received sound effects from QLab, such as dockside soundscapes, whirling seagulls, a cityscape with a tram, and fireworks, all of which were spatially distributed or immersively panned around the room using MIDI triggers. 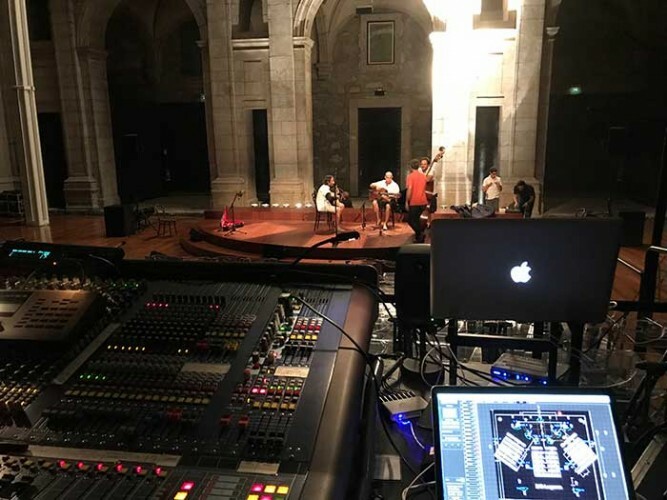 Having waited so long to exercise TiMax in a real scenario, Leal was overjoyed with the sonic experience TiMax created: “The result was astonishing, creating a solid, three-dimensional sense of instruments in the locations, the etymology of where the word stereophony derives! TiMax added massively to the scenes, the soundscapes and the effects, bringing these sounds to credible new life in the space.